This park and campground is a popular destination for music lovers, paddlers and wildlife watchers. Stop at the park office to pick up maps and to pay the admission fee. Twenty miles of hiking and multi-use trails are on offer. One of the park’s big attractions is a super-sized bat house inhabited by thousands of Brazilian Free-tailed Bats. The bat house stands in a field on the south side of the park; enjoy the bats emerging on most warm nights of the year. Bat watchers who are not camping can purchase an evening pass to witness this spectacle. The best birding area in the park is the scenic River Trail, which runs along the river’s limestone bluffs. The trailhead’s observation deck is a good place to scan for Mississippi Kites. In spring and summer look for Acadian Flycatcher, Yellow-throated Vireo, Northern Parula and Carolina Chickadee. Around the fields, pines and upland woods in the southern half of the park check for Eastern Bluebird, Summer Tanager, and Yellow-billed Cuckoo. 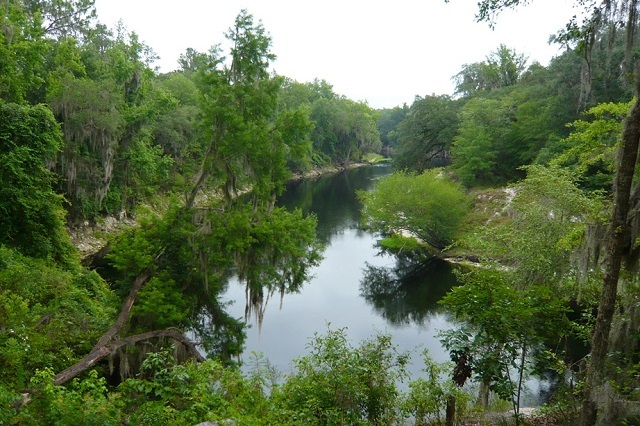 For a nominal launch fee, the Suwannee River Wilderness Trail can be accessed in the northwest corner of the park; paddle your canoe or kayak in either direction for a great experience. The park has a restaurant, rooms and cabins for rent and numerous RV and tent camping options. Bicycles and golf carts can be rented at the park’s Country Store; rent a canoe or kayak at the park’s Suwannee Canoe Outpost.